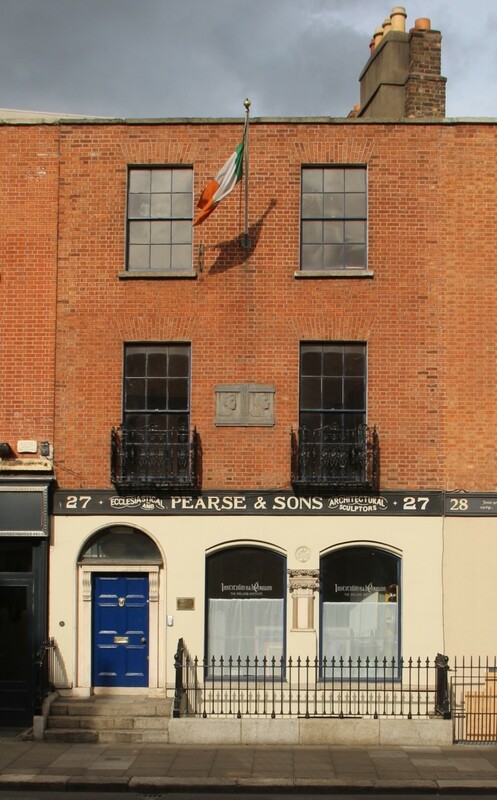 Set facing the busy thoroughfare of Pearse Street is Number 27, the perfect example of a modest Dublin street building of the early 19th century. Constructed around the year 1820 as part of a terrace of similar houses, it developed a major historic association in its later life as home to the monumental sculpting business of James Pearse, father of signatory to the 1916 Proclamation, Padraig Pearse. Following years of alteration under different uses, a major two-year programme of conservation and restoration was overseen by the Trust on behalf of The Ireland Institute for Historical and Cultural Studies which continues to occupy the building. Number 27 encapsulates the building tradition of late Georgian Dublin as it transitioned into the Regency and Victorian ages. Rising three storeys over basement with an elegant red brick façade, finely proportioned sash windows and a railed frontage to the basement well, it typifies the modest scale of buildings erected for an emerging middle class in the opening decades of the 19th century. The interior features handsome rooms, good quality joinery and elegant plasterwork. Originally built as a private house, Number 27 was later converted for commercial use by the Pearse family with a Victorian shop frontage inserted to the ground floor. By the late 20th century the building had lost most of its internal features and variously traded as a car showroom, butcher shop and carpet shop. Through judicious intervention and a careful programme of refurbishment, the original form of the house was pieced back together to the state as it would have been at the time of the Pearse family’s original occupation in the 1880s. It still remains home to The Ireland Institute.